Corbett River Creek Resort is located on the northern periphery of Corbett National Park along the banks of the river Ramganga and a small hill creek. The drive to the resort is through the forest as you descend to the valley floor with the Ramganga River flowing through. There have been many sightings of Deer, Tuskers and even tigers as you drive to your destination of a luxury stay with us. Corbett River Creek is situated at a distance of 35 Km from main Ramnagar, 25 kms from Brijrani Gate & 5 kms from Durga Devi Gate, the location is ideal for angling and bird watching. 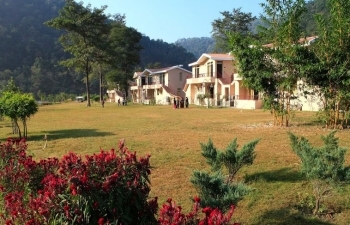 Being in the foothills a small foray into the Himalayas is a must with Ranikhet at a distance of 85 km we offer a stay with us at Vimoksha Resorts and further into the inner Himalayas with us in Chaukori (Vijaypur) at a distance of 131 km at the Chestnut Grove Himalayan Lodge. Accommodation in The Corbett's River Creek Resort comprises of 7 cottages laid out in a sprawling 6 acre grounds with all modern amenities, a home away from home with the added advantage of having the jungle as your back drop the river in front and the tiger as your neighbour. 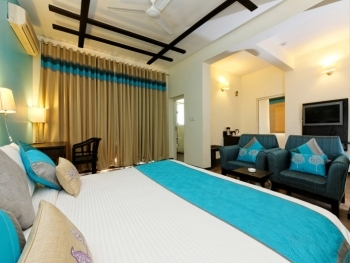 The cottages have 12 standard rooms that can be interconnected, 6 family suites with one main bedroom, a kid’s room and lobby. Two (2) of our units provide exquisite deluxe luxury with 2 separate bedrooms, 2 bathrooms, a lobby and pantry. The units on the ground and first floor can also be used as separate units. There is a multi cuisine restaurant in Hotel Corbett's River Creek: ‘Vadanya’, which serves Indian, Chinese and Continental. There is a Samara The Grill House - Gol Ghar for Barbecues and Kavana - The Hukka Bar. -Swimming Pool with Jacuzzi nozzles. -Fun Zone - Activity Room for Indoor Games, which include Pool, Table Tennis, Play station and other Board Games. -State of art Conference Room - 1000 Sq.ft. -Adventure Activities: Rock Climbing, Rappelling, River Crossing, and Flying Fox, Burma’s Bridge. - Tariff not valid for Christmas, new year and long weekends. - Tea / Coffee Maker with unlimited supply of Amenities. - Taxes Extra as Applicable. Take NH24 from Delhi to Moradabad via Hapur and Gajraula. Then take the state highway to Kashipur and NH121 to Ramnagar a distance of around 257 km to Reach Corbett River Creek Resort from Delhi.